Update 12/05/18: Apple now sells an 18W USB-C power adapter for $26Remove non-product link. To use it with your iPhone, you still need to purchase a USB-C to Lightning cable. We haven't tested it yet, but it should charge your iPhone exactly as fast as all of Apple's other USB-C power adapters. New to this years’ iPhones is fast-charging capability. According to Apple, you can juice up your phone to 50 percent in just 30 minutes! There’s just one catch: You have to buy a new power adapter. Oh, and a new USB-C to Lightning cable, too. That’s two catches, and it's starting to sound expensive. Is it even worth it? We grabbed five power adapters and three iPhones, ran a bunch of tests, and got to the bottom of the iPhone charging mystery. The truth is, while USB-C fast charging certainly works, you’re much better off buying Apple’s 12W USB-A Power Adapter—the one that comes with most iPads. It’s a lot less expensive ($19) and nearly as fast. 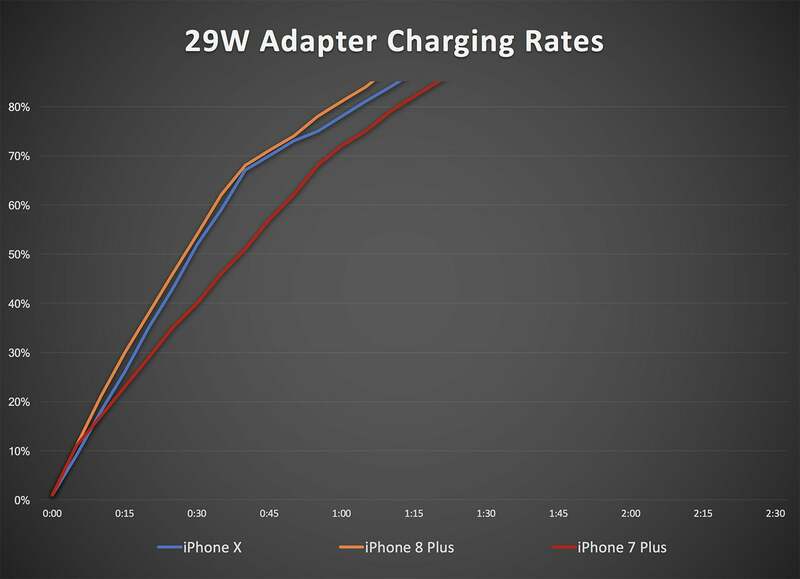 The iPhone X, 8, and 8 Plus all support fast charging from USB-C power adapters that support the new USB Power Delivery (USB-PD) specification. It’s the same way the new MacBooks get charged over USB-C. But we wanted to see how well that stands up to using the adapter that comes with your phone, and the 12W adapter that Apple includes with iPads. What’s more, we wanted to see how these new phones stack up against older iPhones that do not officially support USB-PD fast charging. We tested three phones: iPhone X, iPhone 8 Plus, and iPhone 7 Plus. Wondering how the newer iPhone XR and XS perform? 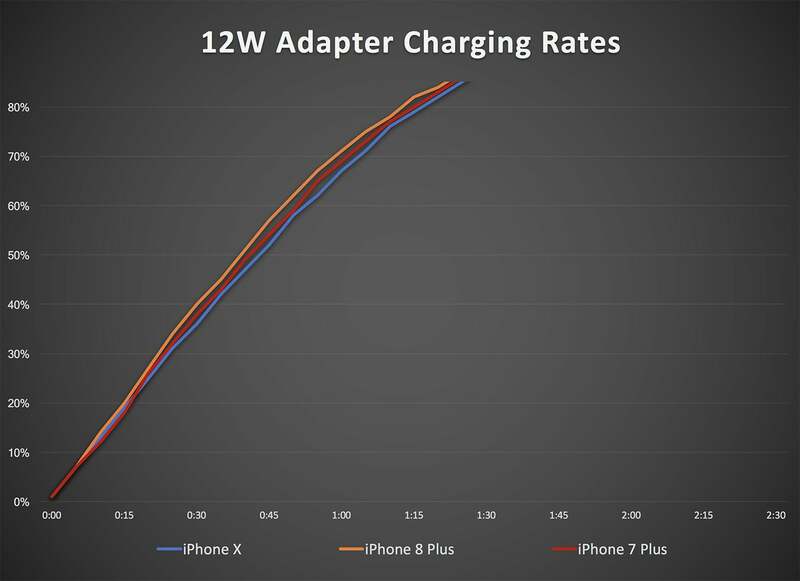 Our cursory follow-up tests show no significant difference in charging rates between them and the iPhone X, with the exception of larger batteries in the XR and XS Max taking a little bit longer (as expected). The iPhone 8 Plus and X have essentially the same size battery. The former is 2691 mAh and the latter 2716 mAh—that’s about a 1 percent difference, so we’ll just call those 2700 mAh. The iPhone 7 Plus has a slightly larger batter at 2900 mAh. That’s less than 8 percent larger, but it is enough of a difference that, even if the iPhone 7 Plus were to draw just as much power as the other phones, it would take just a little bit longer to charge up. For each of these phones, we drained them to 1 percent remaining battery life, then made sure no apps were running and the phone was in airplane mode to prevent any background activity like app updates or photo syncing. We then charged them up with each of our five test adapters, making note of the charge level every five minutes. 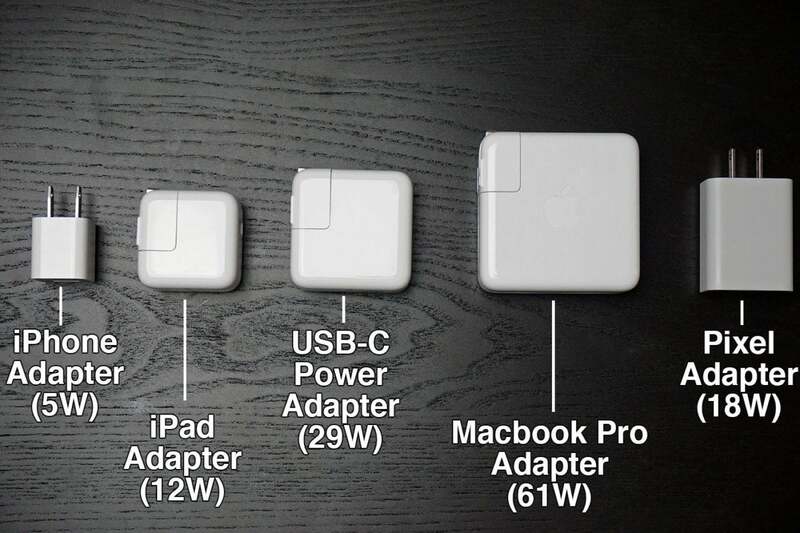 The five adapters we tested. To be sure, Apple's 29W USB-C Power Adapter is probably overkill, able to supply more power than the phones will accept. And that's certainly true of the 61W USB-C Power Adapter for the 13-inch MacBook Pro. 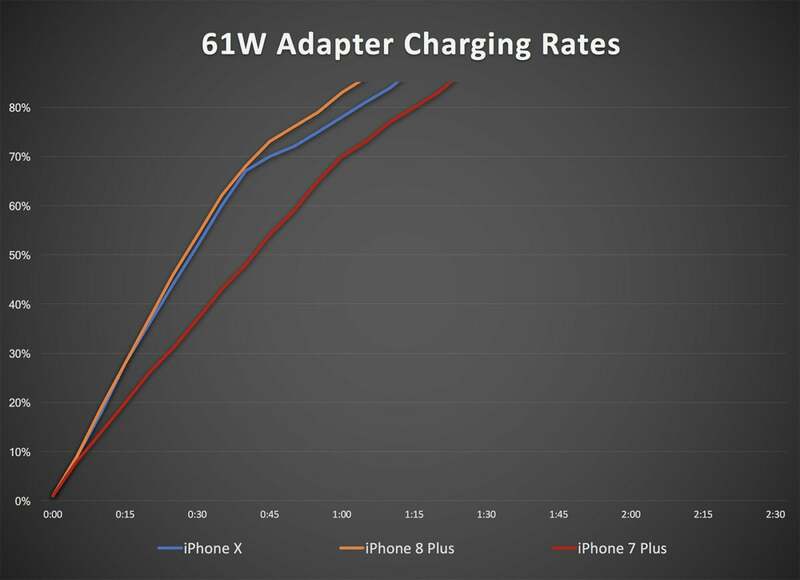 But we wanted to see how well the new iPhones use the USB-PD spec to negotiate power delivery speeds to get the most out of higher-wattage adapters. That's the point behind testing the 18W USB-C Power Adapter for the Google Pixel. It operates using the USB-PD spec, and delivers plenty of power for a phone at 18 watts. It should, in theory, be just as fast as Apple's USB-C adapters. Note: as of December 2018, Apple sells its own 18W USB-C power adapter for $29. You can, of course, buy less expensive USB-C adapters than Apple's. Any USB-C adapter that supports USB Power Delivery should work just fine. Here's one for $25 (we haven't tested it). But no matter what USB-C power adapter you use, you're going to need a USB-C Lightning cable. Apple sells those for a whopping $19 for a 1-meter cable, or $35 for a 2-meter cable. That sound you hear is your wallet crying. Let's take a closer look at how each phone performs when charged up with each of these five power adapters. The iPhone 7 Plus, which has no official support for USB-C fast charging, delivers some interesting results. With the included 5W adapter, the phone takes almost 3.5 hours to fully charge. 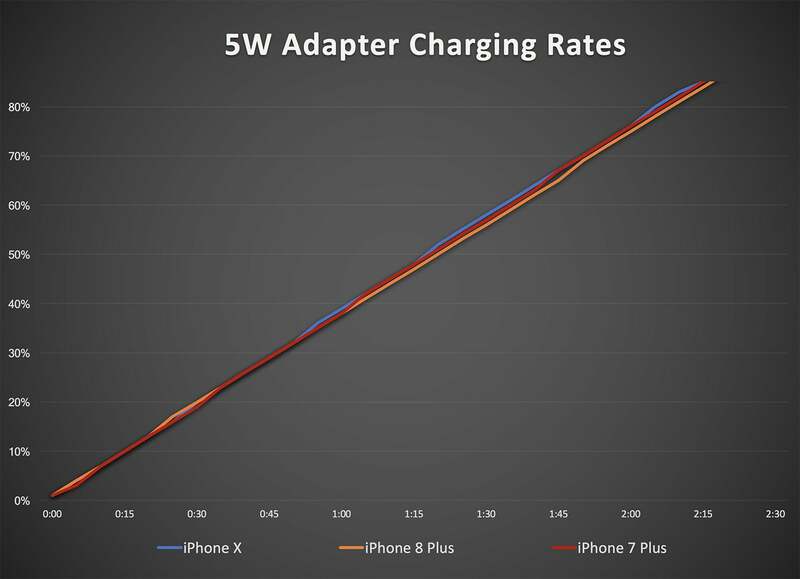 The 12W charger and all of the Apple USB-C chargers deliver nearly identical performance, charging the phone to 85 percent in about an hour and 20 minutes. That's an hour faster than the in-box charger. 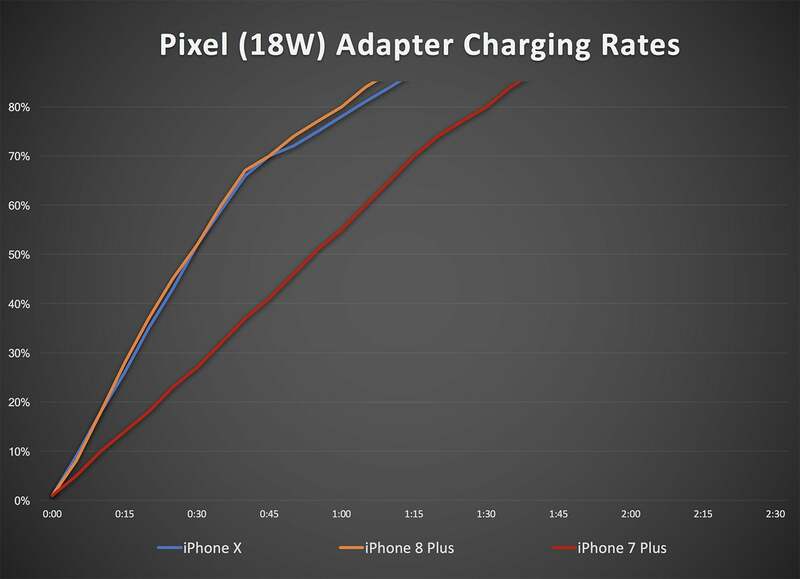 The Pixel adapter is considerably faster than the included charger, but slower than Apple's 12W iPad adapter or any of its other USB-C adapters. Weird! The iPhone 8 Plus charges at the same speed as the 7 Plus when using the 12W iPad adapter. But the USB-C adapters, including the Pixel's, all perform the same and are a bit faster. It's clear that the newer phone is negotiating proper speeds with the USB-C chargers via the USB-PD standard, and that they all deliver as much power as the phone can handle. But the big news here is that the 12W Apple adapter, which requires no new and expensive cable, gets most of the way there. The USB-C chargers are maybe 20 to 25 percent faster. The iPhone X story is essentially identical to the iPhone 8 Plus. The USB-C chargers get you just over 50 percent in half an hour, and fully charge the phone in just under two hours. The 12W Apple adapter is only about 20 minutes behind. It looks like the new phones definitely show benefit from USB-C chargers, but even older phones like the iPhone 7 Plus can use them and charge much faster than with the included 5-watt adapter. Still, given the high costs of the adapter and the USB-C Lightning cable you need to buy to use it, the $19 12W Apple adapter looks like a real deal. It's much faster than the 5W adapter, works with all iPhones, and doesn't require a new cable. And you can see in the charts above, no matter which phone or power adapter is used, the charging rates become very slow after about 85 to 90 percent. Once the phones reach that point, they climb very slowly up to 100 percent. This is perfectly normal behavior for all phones. A lithium ion battery should only be charged at a certain rate once it nears capacity, both for safety and to help preserve the longevity of the battery. Therefore, to make the differences between the various power adapters a little clearer, these next graphs will show the charging rate only up to 85 percent. After that, every adapter is so slow that the differences between them are essentially meaningless, and simply showing how long it takes to get from empty to 100 percent obscures some of the real speed differences between the different chargers. The 5W adapter included with each iPhone is just painfully slow. No matter which phone you have, it charges at roughly 0.6 percent per minute. It takes about 2 hours 15 minutes to get up to 85 percent. 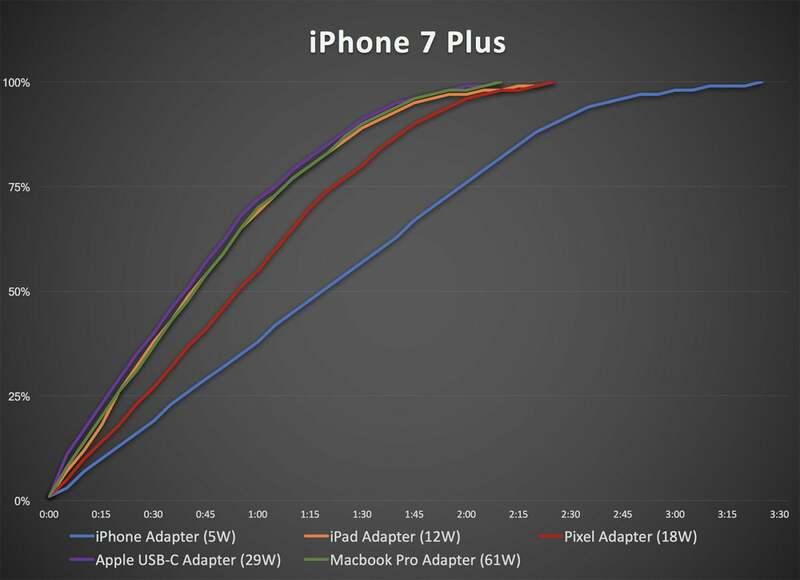 With Apple's $19 12W power adapter, charging speeds skyrocket on all three phones. They're quite similar—all within about 5 minutes of each other. It takes about 1 hour 20 minutes (give or take a few minutes) to charge up to 85 percent, regardless of iPhone model. That's about 70 percent faster than the included 5W charger, and you don't even need to buy a new Lightning cable! Apple's cheapest USB-C adapter costs $49 and requires you to buy a $19 USB-C Lightning cable. What benefit do you get? With the iPhone 7 Plus, none at all. It's exactly as fast as the 12W adapter. If you have an iPhone 8 Plus or iPhone X, you'll get to 85 percent about 10 to 15 minutes faster. The newer phones definitely see improvement with USB-PD compatible adapters, but it seems to taper off after about 70 percent charged. Apple's claim of charging to 50 percent in 30 minutes with the iPhone 8 and X is absolutely true with a USB-C adapter that supports USB-PD. It takes 10 minutes longer to get to 50 percent with the 12W adapter, or with the older iPhone 7 Plus. The MacBook Pro power adapter uses the USB Power Delivery standard, and sure enough, it performs exactly as the 29W adapter does. Any differences are well within the margin of error. This is unsurprising: none of these phones can draw 29 watts, let alone 61 watts, so any properly negotiated charging speed will be maxed out on both of them. Google's 18W USB-C Power Adapter for its Pixel phones costs $35 (though you can sometimes find it for less), and comes with a USB-C cable. So while you'll still need a USB-C to Lightning Cable ($19 for 1 meter, $35 for 2 meters), at least you'll get and extra USB-C cable out of the deal. The maximum power output is 18 watts and that seems enough to charge the iPhone 8 Plus and X at their maximum speeds, just like Apple's USB-C adapters. But the iPhone 7 Plus results are interesting. While Apple's USB-C adapters charge this older iPhone at the same speed as the 12W USB-A adapter, Google's USB-C adapter (despite also adhering to the USB-PD standard) is slower. It's a lot faster than the 5W adapter included with the phone, but not quite as fast as the 12W adapter. Whether you have one of the latest iPhones or a somewhat older model, it's worth your while to buy the $19 Apple 12W USB Power Adapter. It uses the same USB-A Lightning cable that came with your phone and it provides a huge charging speed benefit for new and old phones. It's about 70% faster than the included 5W adapter. Buying a USB-C charger and USB-C Lightning cable will cost a lot more (the cable alone costs as much as the 12W adapter!) and is roughly 20% faster than the 12W adapter. That's a lot of money for a 15-minute advantage. The only real point to diving into USB-C on your new iPhone would be if you can use the USB-C adapter on other products as well—if you have a new MacBook, for instance. When Apple releases new iPads in 2018, they will undoubtedly support USB-PD and benefit from your investment in USB-C Lightning cables. The real crime here is the horrible charging performance Apple gives you out of the box. Apple simply charges too much money for its phones to get away with a piddly 5-watt USB-A charger. At $800 for the iPhone 8 Plus and a whopping $1,000 for the iPhone X, the company should absolutely include a decent USB-C charger and cable. It doesn't have to be the 29W charger they currently sell separately, but something in the 15-18W range would let you charge your phone as fast as it can go. What's more, Apple charges too much for it's USB-C adapters and accessories, but at least you can buy third-party alternatives.